Voting time has arrived! I am extremely excited and honored to be a part of the second annual Rockstar Inked Up World Tour alongside 11 other very talented tattoo artists! Please take a moment to click this link www.InkedUpWorldTour.com and cast your vote for your favorite can art. All you have to do is click on the art you want to vote for, enter your email address, and click "Vote for this Artist." 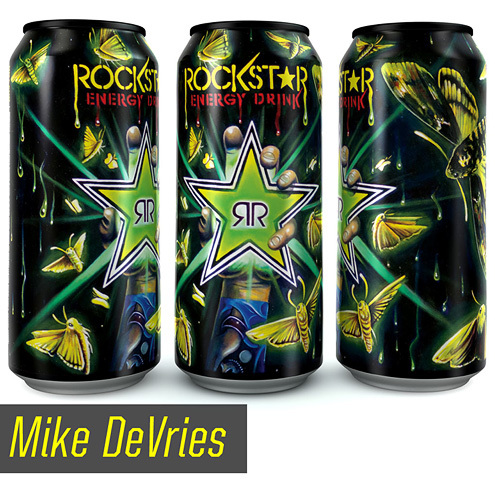 Here's a picture of my art laid out on a Rockstar can! I’ve got some stiff competition, so I definitely need your help and it only takes a second to vote! Win or lose, as a thank you to the people that vote for me, I'll be giving away a free tattoo to one lucky voter at the end of the competition! The winner will be picked at random from the list of voters I'll recieve from Rockstar towards the end of October. You have the option of voting more than once! Everyday you can vote again which will give you a better chance at winning a free tattoo by me! The lucky winner of the free tattoo will have to arrange their own travel and hotel accommodations. The winner will receive a free tattoo that can be completed start to finish in one day (approximately 5-6 hours of tattoo time). If you’re under the age of 18 and you win, you will receive one of my original 16"x20" oil paintings including a custom frame. I’m really looking forward to my tour stop in Calgary Canada in October! Thanks so much for reading and an even bigger THANK YOU for voting for me!